This Portal Is Available to ALL Friends of TRN. Subscriptions are FREE! Please visit FEMA’s Hurricane Michael page for additional information. 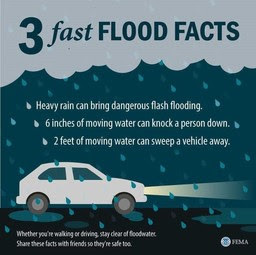 Follow the direction of local officials.Dangerous flooding continues; don’t try to return home until local authorities say it is safe to do so. Keep children out of flood water. Flood waters may contain hazardous materials or dangerous animals. Do not attempt to walk, swim, wade or drive through flood waters. Make sure food is safe to eat. Never taste food to determine if it’s safe to eat. Food may have spoiled if refrigeration was lost during power outage. 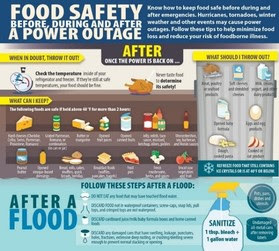 Throw away any food that touched flood water. Keep children out of flood water. Flood waters may contain hazardous materials or dangerous animals. Start the recovery process. If you have insurance, and it’s safe to return home, call your insurance company to file a claim. Take photos and videos of all damages before you start cleaning up. Extreme heat and humidity can be dangerous. Drink plenty of fluids to stay hydrated, and take frequent rest breaks. Accessible videos for people with disabilities, and others with access and functional needs, are available on this FEMA resource webpage. HHS is working with state and local officials to monitor health needs, particularly for people who rely on dialysis and electrically-powered medical equipment. The Department of Health and Human Services (HHS) Office of Civil Rights issued guidance on how to ensure equal access for people with access and functional needs in shelters and facilities during disasters. Unfortunately, criminals can exploit disasters, such as Hurricane Florence, for their own gain by sending fraudulent communications through email or social media and by creating phony websites designed to solicit contributions. Tips should be reported to the National Center for Disaster Fraud (NCDF) at (866) 720-5721. The line is staffed 24 hours a day, seven days a week. Additionally, e-mails can be sent to disaster@leo.gov. Learn more about the NCDF at www.justice.gov/disaster-fraud and or watch the public service announcement posted online here. Additional tips on how to avoid being victimized of fraud are posted on the Department of Justice’s website. · To seek assistance from FEMA you can register online, at www.DisasterAssistance.gov, is the quickest way to register for FEMA assistance since the event will last several days and the full scope of damages may not be evident until the storm has passed. If you are unable to access the internet, you can also call at 1-800-621-FEMA (3362). · Disaster Unemployment Assistance benefits are available to those whose jobs were affected by Tropical Storm Harvey in Texas, specifically those who live or work in the counties included in the major disaster declaration. This may include people not normally eligible for unemployment benefits, such as self-employed persons and farm-workers. · The compassion of the American people is already evident in their response to the destruction the storm has caused. People can help by visiting the National Voluntary Organizations Active in Disaster (NVOAD) website atnvoad.org to donate or volunteer with the voluntary or charitable organization of their choice, many of which are already in south Texas and Louisiana supporting survivors, even as the rain and wind continue. · Critical Needs Assistance (CNA) has been approved for eligible survivors in the state of Texas. CNA is intended for individuals and households who, as a result of the disaster, have immediate or critical needs because they are displaced from their primary home. Immediate or critical needs include, but aren’t limited to, water, food, first aid, prescriptions, infant formula, diapers, consumable medical supplies, durable medical equipment, personal hygiene items, and fuel for transportation. CNA is a one-time, limited payment per household for eligible applicants who register for FEMA assistance. 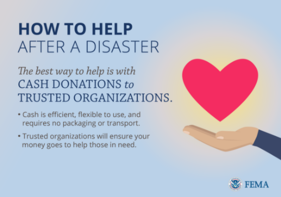 · Transitional Sheltering Assistance (TSA) has been approved in Texas for eligible disaster survivors who have a continuing need for shelter because they are unable to return to their homes for an extended period of time. To be eligible for TSA, you must be registered for FEMA disaster assistance. As of this morning, more than 7,900 survivors have checked in to hotels and motels through he TSA program. Hotels interested in participating in the Transitional Sheltering Assistance (TSA) program may visit Corporate Lodging Consultants (CLC) website at https://ela.corplodging.com/. The website provides details on the activation of TSA for Hurricane Harvey, as well as a mechanism to enroll in the program for a lodging provider interested in participating.